P.S. Daima and Sons are one of the reputed manufacturers, suppliers and exporters of leather buttons and toggles. Our range of products includes leather buttons with laser engraving, cow / calf leather buttons & toggles, split suede leather button & toggles, white leather button, real suede leather button & toggles, white leather toggle etc. Complementing garment and home decor, leather buttons are versatile and are used for fastening and decoration. While, leather toggles are the strongest toggles used as a zip closure in sweaters, jackets, coats, boots etc. These toggles are offered in various finishes like leather stain, leather dye, oil dye and many more. Both leather buttons and toggles are offered at the most competitive prices. A wide range of leather buttons with laser engraving is available in regular colors, metallic colors, dyed colors etc. These engraved buttons are available with four holes as well as two holes. 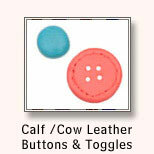 Our range of cow / calf leather buttons & toggles is offered in various shapes like round, square, heart etc. Available in different colors, these buttons are offered in different sizes. 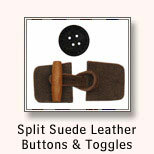 Presenting a wide range of split suede leather button & toggles in various sizes. These suede leather buttons and suede leather toggles are thick and are available in natural colors. Thickness and color of these leather buttons will vary as they are natural products. 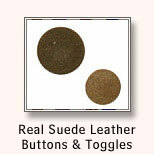 We offer real suede leather button & toggles in various colors, sizes and shapes. These suede leather toggles and buttons are thick and their thickness and color varies because it is a natural product. 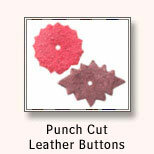 Avail from us a large variety of punch cut leather button in plethora of colors and shapes. These leather button can be customized as per the requirement of the client.